Annie Get Your Gun is the story of the fictionalized life of Annie Oakley (1860-1926). She is the best shot around (played by Edi Darnell), and she manages to support her little brother and sister by selling the game she hunts. Annie is discovered by Col. Buffalo Bill (K.C. Boatright) and travels with Buffalo Bill’s Wild West Show. When they visit Cincinnati, Ohio, the show’s handsome, womanizing star, Frank Butler (Alex Syragakis) challenges anyone in town to a shooting match. Foster Wilson (Hannah Schuler), a local hotel owner, doesn’t appreciate the Wild West show taking over his hotel and enters Annie in the match against Frank Butler. As the two are forced to work together, they discover their romantic feelings toward one another, but Frank’s desire to always be the best shot holds him back from falling in love with Annie. To complicate matters more, Buffalo Bill doesn’t want to let Annie leave the show, even if it means losing Frank. If she does, his Wild West show could end up bankrupt. Brandon Triola, a member of AEA (Actor’s Equity Association), is directing his sixth production with the Seahawk Stage Company at Hilton Head Island High School. Assistant director is his wife, Amanda Bond, a 17-year veteran of the performing arts. Musical direction is by Josh Wall, and returning to the Seahawk Stage Company as the choreographer is Jamal Edwards. 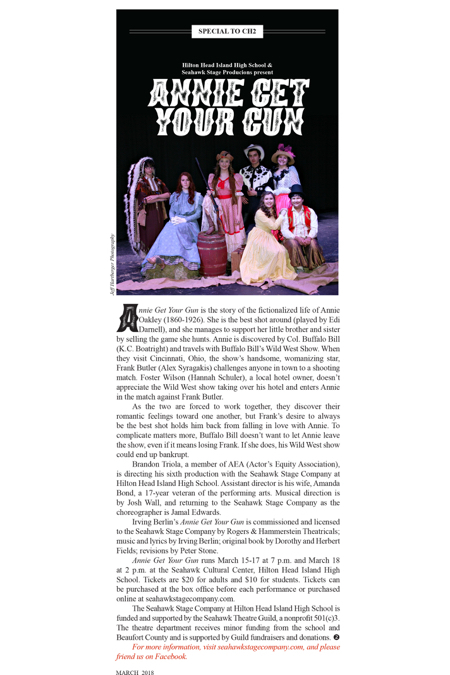 Irving Berlin’s Annie Get Your Gun is commissioned and licensed to the Seahawk Stage Company by Rogers & Hammerstein Theatricals; music and lyrics by Irving Berlin; original book by Dorothy and Herbert Fields; revisions by Peter Stone. Annie Get Your Gun runs March 15-17 at 7 p.m. and March 18 at 2 p.m. at the Seahawk Cultural Center, Hilton Head Island High School. Tickets are $20 for adults and $10 for students. Tickets can be purchased at the box office before each performance or purchased online at seahawkstagecompany.com. The Seahawk Stage Company at Hilton Head Island High School is funded and supported by the Seahawk Theatre Guild, a nonprofit 501©3. The theatre department receives minor funding from the school and Beaufort County and is supported by Guild fundraisers and donations. For more information, visit seahawkstagecompany.com, and please friend us on Facebook.